When Martin and Felix of Urwerk wanted to create something new – they had to sit down for a while and think about what they had done before, and what they could follow up with that was unique in the watch world. Doing that is really tough. Even the satellite time telling system that Urwerk is known for isn’t unique to them, originating a long time ago elsewhere. Urwerk just sort of adopted the satellite system of telling the time and made it their own. The Torpedo – as the UR-110 is also called – does two things differently. It modifies the satellite system a bit offering a fun new visual spectacle, and put it in a case that is novel, as well as weird. On the wrist the UR-110 takes some getting used to. It doesn’t look like any watch case I’ve ever put on before. I jokingly described the design as a”mutated ninja star” (which apparently only makes sense in my head). Think of a modified Urwerk UR-103 watch case with wings. I guess that makes sense… torpedoes fly under water right? If you have a giant wrist the Torpedo will probably sit well, though for me the wings stick out like the watch is trying to gain altitude. The “coined edge” around the side of the organic looking case is nice, and the detailing is of course on par with a high-end timepiece. Dimensions for the case are an awkward 47mm wide by 51mm tall, and 16mm thick – but that all ranges given that the case curves around a lot. While it looks like it is sitting on your wrist as opposed to around it, the watch doesn’t feel like it is going to slide all over the place as the bottom is mostly flat. As I said a few times, the titanium case looks a bit bare and “unfinished.” Some people might like that look, but I am waiting for the black colored case that is coming out soon. I anticipate that model to frame the design of the watch much better. Naked titanium is not always easy to pull off. I also think that if the wings were angled down to sort of wrap around a wrist, it would make the design of the watch much more manageable. 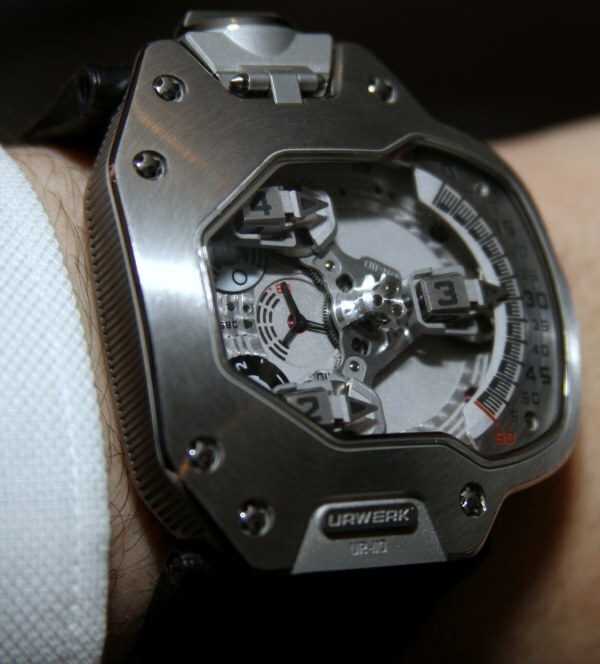 Urwerk calls the movement their UR 9.01, and it is easily the high point of the watch. 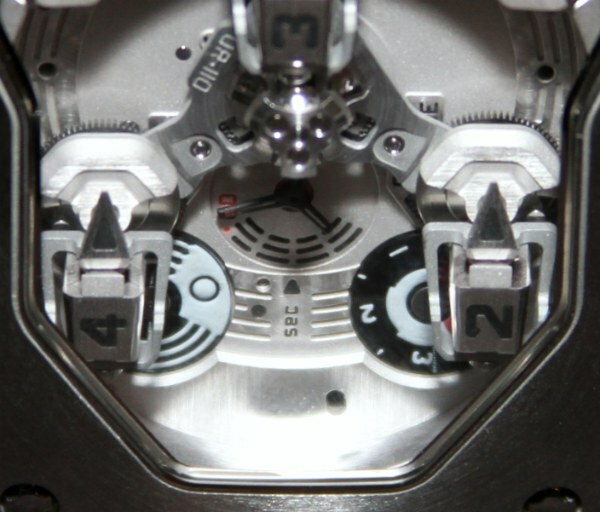 The movement is an automatic, and has those cool little “turbines” visible through the rear of the watch that spin when the rotor is spinning. 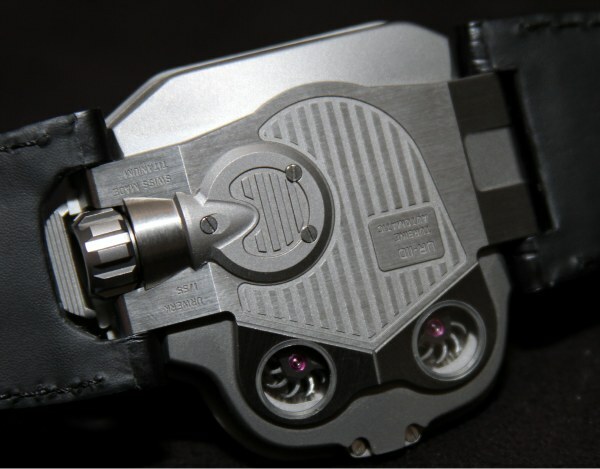 Urwerk also points out that the turbines helps prevent shock damage to the rotor. Back on the dial you have the three satellites that have four hours on each of them. When moving around, they always point “forward” while moving. That is pretty cool, and when they move close to the minute scale, the correct hour on the cube spins around. Telling the time is easy, and the idea behind the placement of the minute scale is so that it is the first part of the watch you see when your arm peeks out from under a sleeve. The dial also has a subsidiary seconds dial, a “oil change” indicator, and a day/night indicator. The oil change indicator is a sort of service guide that advises you when to send your watch back to Urwerk for a (pricey) service. It is an homage to such indicators on cars. Future variations on the UR-110 are likely to have alternative complications. I feel as though the dial is a bit incomplete. While it is clean, the sandblasted surface under the satellite system for the hours feels a bit bare. Like I keep saying, the Torpedo is pretty nice all around, but it looks like Urwerk could put just a bit more time into polishing the design – which they likely will. Detailing on the dial is however really nice. Urwerk always impresses me with how crisp their parts look – and the Torpedo dial and mechanics is no exception. Operating the movement is cool as well. The crown has a sort of lid over it that you just gently pull up a bit to allow it to adjust the time. The crown is placed at the top of the watch. You can see it better from the bottom of the 110. 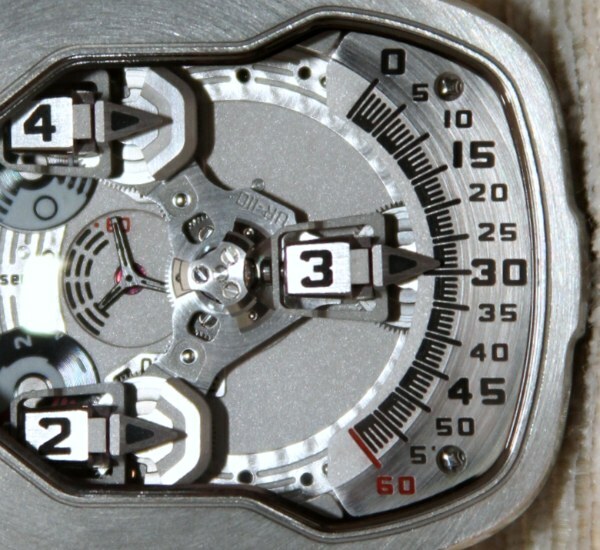 In fact – and this the case with a few Urwerk watches – I might like the caseback of the watch more than the dial! That element of the watch is pretty handsome. On the plus side the UR-110 Torpedo is unique, well-made, and easy to read. At the same time, it could use a bit more design refinement and can take some time to get used to on the wrist. Urwerk fans will likely welcome its addition to the collection, and it does feel different enough, while keep in line with the look and feel that Urwerk is going for. It’s looks like some transformero-terminator device on your wrist! Crazy cool. I disagree with the “nakedness” of this, I love the raw look the Ti has. The size is certainly akward, but that would never stop me from giving it a try. Statements like this are what it’s all about to me. This will probably end up with a thin audience because of how out there it is, like pretty much everything Urwerk, but it certainly has my attention. And did they get Michael Bay to direct that video? Awesome. I think the only real mistake here is the shiny croc strap. This would probably be better complimented with rubber or some kind of ballistic material. Love Urwerk’s designs and originality. Wish I had the clams to afford them. This is a stunning watch. Unconventional to say the least, and easy to read so no sacrifices to practicality. The only downside is, as you point out, that it is huge and not really contoured to the wrist. Another colour combination would be nice, that allows the numerals to stand out more. All that shiny metal tends to glare them out. Lume would be a nice addition too. Sorry, but the emperor has no clothes on this one. That is just a awful looking watch. Plus, it’s too big, and even though it so big, it’s difficult to read. Just because it costs a lot of money, does not make it a good design. I’m Interested in which watch the satellite system did actually originate, anyone know? Stunningly well crafted although i prefer the look of their previous designs. Damn man how stunning is that movement! It had me mesmerised right from the start of that cracking video. It’s just a shame that is is stuck inside a not particuarly nice looking or what looks like an not particularly easy to wear watch. What a machine! (If I were rich) I’d buy one even if it didn’t tell the time. Fascinating. 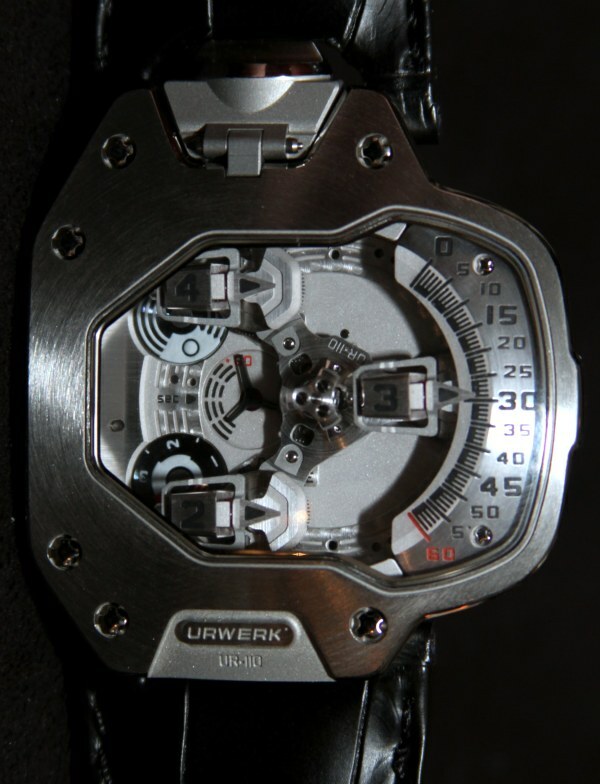 I admire Urwerk’s innovations, but does anyone else find it weird for two satellite torpedoes to cover subdials? Very interesting.But the thing could have better surface finished. I’d love to see how it works,but I couldn’t stomach the video. What do they have – one company on the entire Euro continent that makes these self-absorbed, pretentious videos? Cool concept, 85% complete execution. Finishing is easy to fix, but the “winged” case design… I know I would eventually chip the metatarsal of some poor tourist walking about. Anyways, is there anybody making a satellite that even comes near being “affordable”? Swiss Army, I’m looking at you!! !